but it is the addition of complementary rich purple and cooling lavender that makes the combination really distinctive. Silvery Artemisia and Buddleia foliage, along with feathery ornamental Grasses, serve not only as mediators between the bold colors, but also as structural elements that will lend year-round beauty to the border. Reaching its full glory at the height of summer, the show will continue well into early fall, thanks to late-flowering Asters and ornamental Grasses joining the parade of prolific summer bloomers. To use this strong color scheme most effectively, remember that bright colors appear doser than they actually are. So a garden area viewed from a distance is a perfect location for your hot-color border. The beauty of this energizing combination is not only its visual appeal but its ease of upkeep. All of the selected plants are perfectly at home in average garden soil and have modest watering requirements. These tough, easy-care varieties will give you year after year of low-maintenance, long-season enjoyment. Bright Colorful is a garden to be viewed from a distance. Plant away from paths and entry ways to capture the visual appeal of intense colors. Be sure to give the larger Grasses and Buddleias plenty of space, at least three feet between plants. 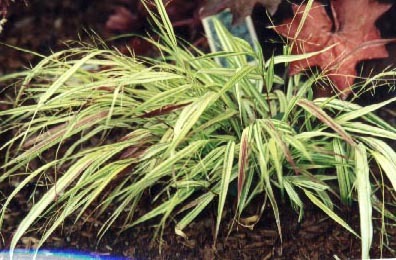 f.	Calamagrostis arun. Var. brach.